With attention to issues that continue to surface in today's church, the Zondervan Exegetical Commentary on the New Testament series offers pastors, students, and teachers a focused resource for reading, teaching, and preaching the Book of Acts. Acts highlights (1) the work of God through the exalted Jesus who grants the presence of the Holy Spirit; (2) the significance of Jesus who is Israel's Messiah and the Savior of the world and who directs the expansion of the church; (3) the work of the Holy Spirit as transforming power present in the lives of the followers of Jesus and their communities; (4) the identity of the church as the community of God, comprised of Jews and Gentiles who are followers of Jesus; (5) the mission of the church whose leaders take the gospel to cities and regions of the Roman Empire in which Jesus has not yet been proclaimed as Messiah and Savior; (6) the historical events and the persons who played a role in the expansion of earliest Christianity. 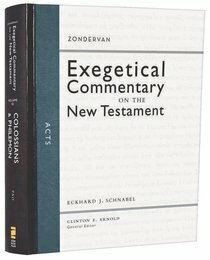 About "Acts (Zondervan Exegetical Commentary Series On The New Testament)"
Eckhard J. Schnabel (Ph.D., University of Aberdeen) is associate professor of New Testament at Trinity Evangelical Divinity School in Deerfield, Illinois. He has taught previously at Freie Theologische Akademie (Giessen, Germany), Wiedenest Bible College (Bergneustadt, Germany) and Asian Theological Seminary (Manila, Philippines). He is coeditor with R. Brockhaus of Historisch-Theologische Auslegung des Neuen Testaments (Verlag, 1995), and he wrote articles in IVP's Dictionary of Paul and His Letters and Dictionary of the Later New Testament. His latest publication is a commentary on First Corinthians (Der erste Brief des Paulus an die Korinther. HTANT. R. Brockhaus, 2006) and he will author The Acts of the Apostles in the soon to be produced Zondervan Exegetical Commentary Series (edited by David Garland). Dr Schnabel is well known for his work of missions in both German and English including two-volume Early Christian Mission is widely recognized as the most complete and authoritative contemporary study of the first-century Christian missionary movement, and his most recent work Paul the Missionary.